"You’ve got to get busy living or get busy dying." 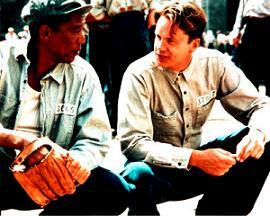 Both Andy Dufresne and Red said it. The story for the movie was written by Stephen King. I’ve enjoyed this quote so much over the years, because it makes a lot of sense, especially when I’m depressed. The people who meet challenges head on and work even harder to overcome them are the people who are living. The other choice is to sit around moaning which will eventually end with you dying. Too many people in our society don’t want to make the effort it takes to live. They don’t want to go to school or get an education, because it’s "boring" or "too hard". They can’t get a good job, because they don’t have the education. So they sit and whine and think that others who have worked for what they have should be sharing the fruits of their labors with them because they don’t have anything. I made up my mind long ago to be one of the people who spend their lives busy living, and it has helped keep me from the pitfalls of life and the downhill turn that too many people make.